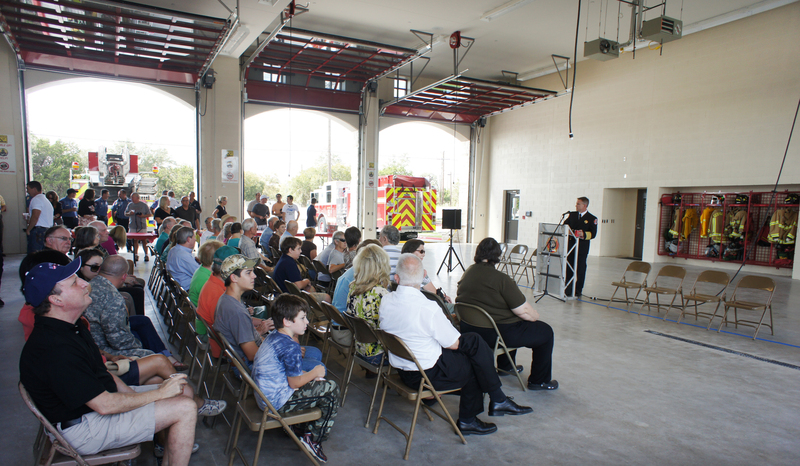 On Wednesday, October 10th, 2012, the City of Georgetown and Georgetown Fire Department celebrated the dedication and grand opening of the new Fire Station No. 5 and Fire Training Facility. The ceremony opened and closed with music from the Georgetown Fire Department Pipes and Drums Band. Fire Chief Robert Fite and Mayor George Garver spoke at the event, thanking everyone involved in making the project a reality. Chief Fite encouraged the citizens to explore every last corner of the facility and truly appreciate what their tax dollars made possible. Following the speeches was the traditional “hose uncoupling” in lieu of a ribbon cutting, after which firefighters pushed Engine No. 5 into the apparatus bay. At the conclusion of the ceremony, attendees were free to tour the entire facility and enjoy breathtaking views from the 4th story of the new training tower. 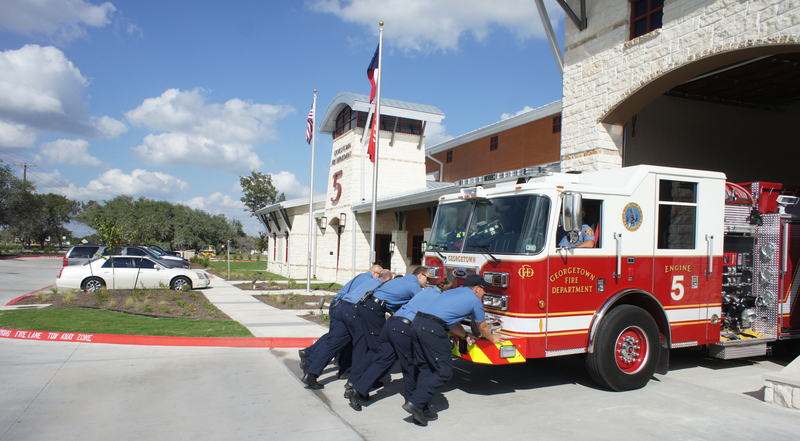 BRW incorporated traditional Texas hill country elements into the design of station 5, such as white limestone, stained siding, and a covered front porch. At the same time, the massing and roof forms of the building give it a contemporary and unique look that will easily complement the new public safety complex adjacent to the site, which is currently in design. The distinctive red bay doors and red windows give the building an unmistakable fire house character. The entire complex consists of the new 12,137 square foot fire station, a 2,838 square foot training classroom building, and a four story training tower and burn building. The station includes three truck bays with support spaces, sleeping spaces for ten featuring suites for captain and lieutenant, and common spaces such as a kitchen, day room and exercise room. Station 5 currently houses fire administration offices which will move to the new public safety building once completed, allowing future expansion of the station’s personnel and capabilities. Behind the station is the training classroom building with a large indoor/outdoor classroom and three garage bays for boat and trailer storage. Adjacent to the classroom building stands the training tower and burn building, which offers a variety of training scenarios for live-fire training and technical rescue instruction. Neighboring fire departments are already lining up to utilize the new training facilities.